Uncork is a leader in wine information, home wine cellar management software, and associated accessories including wine bottle tags, barcode readers and hygro thermometers. The first version of The Uncorked Cellar ® was produced in 1996, and has been improving continually ever since. The Uncorked Cellar is excellent wine cellar software with an integrated wine guide providing winery details, wine ratings, value guide, winemaker's notes, cellaring guide, and a visual rack display for wines in your cellar. The wine guide section of the program includes information about over 950,000 wines which is supplied by the respective winemakers. Uncork also supply wine tags, hygro thermometers and a barcode reader to help you easily select wines from your home wine cellar and look after your wine collection. The Uncorked Cellar will easily capture, maintain and display your wine inventory complete with all wine-related information. Save your cellar on the web, or locally on your PC. Look up wines using the UPC code on the bottle, or a barcode printed on the wine inventory tag. 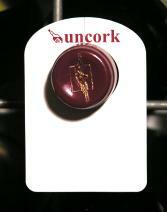 Made from durable plastic, these reusable write-on Wine Bottle Necktags are a unique design that snap on to the neck of almost any sized wine bottle and never fall off. Write on with any felt-tipped pen or white-board marker. 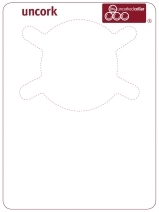 Create your own layout for these inkjet or laser printable wine tags, or hand write brief notes on the tag. 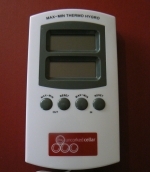 These hygro-thermometers remember the highest and lowest temperature and humidity of your wine cellar.